On the occasion of World Rare Disease Day, an interactive session for parents of children with rare diseases was organized by the Sheikh Hamdan Bin Rashid Al Maktoum Award for Medical Sciences. At the session, it was called on the UAE society, individuals and institutions to: shed more light on rare diseases, raise awareness of prevention among families at risk of having children with rare diseases, work on providing affordable therapy and integrate patients into the community. 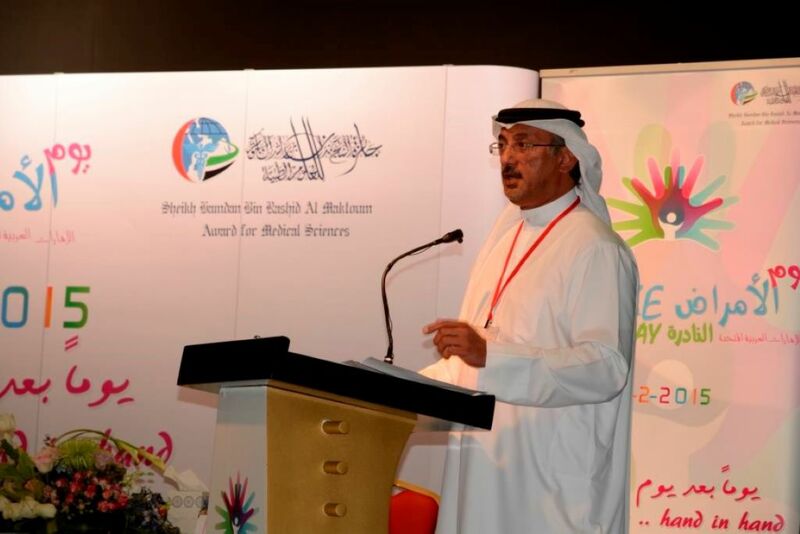 From the Children's City auditorium in Creek Park, Dubai, Mr. Abdullah bin Souqat, Executive Director of Sheikh Hamdan Bin Rashid Al Maktoum Award for Medical Sciences, opened the activities of the Rare Disease Day in the presence of the chairpersons of the Organizing Committee, namely Dr. Fatima Bastaki, Consultant, pediatric clinical genetics, and Dr. Fatima Al Jasmi, Consultant, genetic metabolic diseases. Approximately, 400 people participated in the event including children with rare diseases and their families. Additionally, officials from the UAE Ministry of Social Affairs and Community Development Authority, doctors and experts in health and social care for people with special needs also took part in the event. During his opening speech, Abdullah bin Souqat stressed that organizing this event comes in response to the directives of H.H. Sheikh Hamdan bin Rashid Al Maktoum, Deputy Ruler of Dubai, UAE Minister of Finance, Chairman of Dubai Health Authority and the Patron of the Award. He stated that fulfilling the needs of the medical community and improving health services provided to all segments of society was a top priority on His Highness’ agenda. “Concerning rare diseases, the Hamdan Medical Award is keen to increase the awareness among decision makers in all health and social state institutions. So far, there isn’t enough data reflecting the actual problem in the UAE, and obtaining such information is vital to take necessary actions in terms of prevention, treatment or integrating patients into the community”, he added. Sheikh Khalid Ismail gave a lecture entitled "It's a mercy". He explained how difficulties in one’s life can be considered as a trial by God, and it can bring mercy in the afterlife. “One of the most painful moments in life is when one is told that his/her child has a rare disease. A considerable number of these diseases have no definite treatment and can be accompanied with severe disability or be fatal”, he said. “While seeking advice and treatment from specialists, parents must believe that it is God’s will, and He is the most merciful”. The lectures were followed by an interactive session held with the participation of Sheikha Dr. Alia Al Qasimi, Director, Social Program & Inclusion Department, Community Development Authority, Dr. Awatif Jumaa Al Bahr, consultant, Obs./Gyn. & Endocrine Infertility, Gynecology and Fertility Centre, Dubai Health Authority, Dr. Bushra Al Mullah, health and social care expert for children with disabilities, Mr. Rawhy Abdat, Deputy Director, Department of Handicapped Rehabilitation, Dubai, Ministry of Social Affairs and Dr. Leena Amiri, consultant, psychiatrist for children and adolescents, UAE University. Sheikha Dr. Alia Al Qasimi, Social Program & Inclusion Department, Community Development Authority, spoke about the Authority’s role in providing various programs and initiatives to enable people with disabilities and integrate them into the society. She gave a full account of the services provided by the Authority to protect people with disabilities from all types of discrimination, abuse, neglect or exploitation. “The authority is keen to strengthen the cooperation with all relevant institutions in Dubai to raise awareness in the community towards the rights of disabled persons and provide a good working environment for them”, she said. “The Dubai Early Childhood Development Centre provides assessment and early intervention for Emirati children under 6-years of age with disabilities. In addition to counseling services provided to the children’s families, the Centre provides rehabilitation services for children to be integrated in their nurseries, kindergartens and schools,” she noted. Dr. Awatif Al Bahr, consultant, Obs./Gyn. & Endocrine Infertility, Gynecology and Fertility Centre, Dubai Health Authority, spoke about the Center which was founded in 1991 and now receives 2,700 cases annually, half of which are UAE nationals. She pointed out to the fact that the Center pioneered pre-implementation Genetic Diagnosis, a diagnosis of genetic diseases prior to transferring embryos into the uterus, with success rates of up to 61%. “The center provides preventive procedures for couples with a risk to have children with genetic diseases”, she said. On the other hand, Dr. Bushra Al Mulla participated in the discussion neither in her capacity as the Director of the Department of Education and Social Affairs, the Prime Minister's Office, nor as an expert in the field of social and health care for people with disabilities, but as a mother of three children, one of whom is a child with a disability. She added that this child was her inspiration to succeed and turn challenges into achievements. “The most important challenges for persons with disabilities are to receive appropriate medical, educational and rehabilitative services. These services should be supported by policies, operational plans and laws by considering the diversity of people with disabilities and their ages”, she added. Mr. Rawhi Abdat, Deputy Director, Department of Handicapped Rehabilitation, Ministry of Social Affairs, spoke about the role of the ministry in the education and rehabilitation of people with disabilities. Dr. Leena Al Amiri, consultant, children and adolescents psychiatrist, UAE University, spoke about the psychological problems in children with special needs, which are mainly related to their inability to cope with the conditions of their diseases, the symptoms or treatment. “Fear from the disease may lead to children’s hyper activity, hyper tension, or inability to be integrated into the community or the school”, she said. “It is not only important to adapt children with special needs, but also to adapt their families, especially their siblings who sometimes have to sacrifice things that might mean a lot to them”, she added. Dr. Leena Al Amiri praised the session as of the ideal channels to discuss common difficulties for people with special needs and search for its solutions, from the professionals or from other families who have faced similar situations previously. At the end of the session, Mr. Abdullah bin Souqat, Executive Director of Sheikh Hamdan Bin Rashid Al Maktoum Award for Medical Sciences honored the guests who participated in the session and presented them with trophies of the rare disease day. The children enjoyed the interactive entertainment program organized in conjunction with the session under the supervision of a distinguished group of volunteers. Additionally, the chairmen and the members of the organizing committee honored the members of the UAE Cycling Federation and the Emirates Motor Sports Federation who participated in the motorcycles and bicycles' march which toured many places in Dubai, carrying the logo of the Rare Diseases Day.